This cabinet card photograph features a portrait of a southern gentleman. He is finely dressed and holding his hat in his hand. He is wearing a stylish beard and mustache. His facial expression communicates arrogance. The photography studio that produced this image is the Johns & Faught studio of Lexington, Kentucky. The cabinet card gallery has other photographs by this studio and they can be seen by clicking the category “Photographer: Johns & Faught” or by placing the studio’s name in the search box. If you view the other photographs you will note that this studio does an outstanding job with their portrait photography. 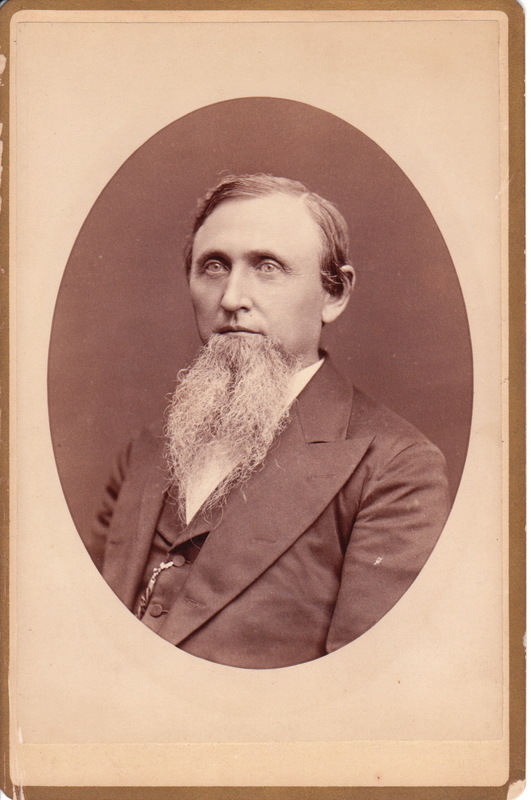 In the book “History of Fayette County, Kentucky” (1882) it is stated that W. E. Johns was born in Lexington in 1843. He began his photography business in Lexington in 1870 and by 1876 opened a new studio at the address (56 East Main Street) where he photographed this cabinet card. By at least 1886, James Faught worked for Johns as an operator in his studio. At a later date, the pair became partners in the business. BABY RIDER POSES ON A ROCKING HORSE: KENTUCKY DERBY CONTENDER? 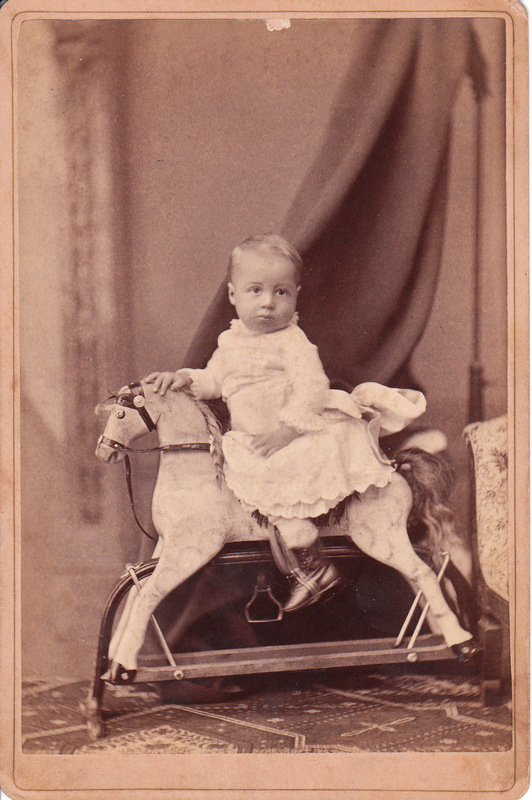 This cabinet card is a portrait of Edwin Jacobs, son of Edwin and Lilla Jacobs, posing on a rocking horse. Note the detailed rocking horse which features reins, harness, stirup, mane and long tail. Young Edwin doesn’t appear to be excited about his opportunity to ride the horse. The photographer is Johns and Faught of Lexington, Kentucky. To view other photographs by this studio, click on the category “Photographer: Johns & Faught”. Kentucky is horse country and of course, the home of the Kentucky Derby since 1875.